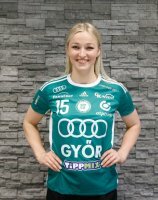 Velkommen Stine Bredal Oftedal! 3 years in ETO's green-white jersey! But for people who don't know, the doctor (Thierry Weizman) is also the president of Metz Handball. Thanks for the info. I didn't know. You forgot to add that your wish would be Buducnost to win at FTC. My wish is for ETO to win the title in CHL this season in a final with FTC. As for your other "crazy ideas" - no comment. And please do not reply to me cause you will not get an answer anymore.